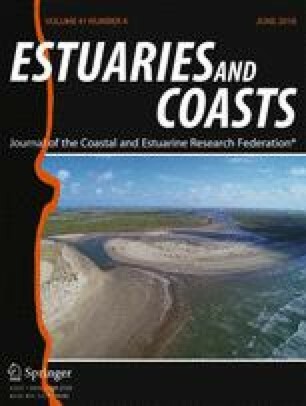 We compiled and examined 15 years (2002–2016) of high-frequency monitoring data from the National Estuarine Research Reserve System (NERRS) to characterize diel to interannual variability of pH and dissolved oxygen (DO, % saturation) across 16 diverse, shallow-water habitats along the US Atlantic, Gulf of Mexico, Caribbean, and Pacific coasts. We asked whether these systems exhibit a common pH/DO relationship, whether there were detectable interannual trends in temperature, pH, and DO within and across systems, and how pH/DO dynamics would relate to measured levels of nutrients and chlorophyll. Our analyses confirmed that large, metabolically driven, and thus concurrent fluctuations of pH and DO are a unifying feature of nearshore habitats. Moreover, we derived well-constrained relationships that predict (i) monthly mean pH or (ii) mean diel pH fluctuations across systems based on habitat mean salinity and (i) mean DO or (ii) mean diel DO fluctuations. This suggests that common metabolic principles drive diel to seasonal pH/DO variations within as well as across a diversity of estuarine environments. Yearly pH and DO anomalies did not show monotonous trends over the study period and differed considerably between sites and regions. However, weekly anomalies of means, diel minima, and diel ranges of pH and DO changed significantly over time and were strongly correlated to temperature anomalies. These general patterns lend strong empirical support to the notion that coastal acidification—in addition to being driven by eutrophication and atmospheric CO2 increases—is exacerbated simply by warming, likely via increasing community respiration. Nutrient and chlorophyll dynamics were inversely related in these shallow, well-mixed systems, but higher nutrient levels were still associated with lower pH and lower DO levels in most, but not all, systems. Our analyses emphasize the particular dynamics of nearshore habitats and the critical importance of NERRS and its system-wide monitoring program. The online version of this article ( https://doi.org/10.1007/s12237-017-0321-3) contains supplementary material, which is available to authorized users. This study would not have been possible if the NERRS System-Wide Monitoring Program did not exist. Our gratitude to the entirety of the SWMP technical staff for their dedicated and meticulous efforts in maintaining this valuable program for more than two decades cannot be overstated. This study was partially supported by NSF #1536336 to H.B. and NOAA #NA15NOS4200120 to E. S.
Cai, W.J., Z.A. Wang, and Y. Wang. 2003b. The role of marsh-dominated heterotrophic continental margins in transport of CO2 between the atmosphere, the land-sea interface and the ocean. Geophysical Research Letters 30, 1849. http://dx.doi.org/10.1029/2003GL017633.